The evolving facility, with state-of-the-art equipment, allows for the company to supply customers with beautiful results, whether for condominiums and apartments, or hotels and hospitals. While most jobs are of residential or commercial nature, Classic Granite & Marble has also completed enhancements for different types of businesses, such as veterinarian and lawyers’ offices. In the past, the sales region has covered a 60-mile radius. The shop has the advantage of being in central Virginia, so they can go to different areas of the state where there are not as many fabricators. The region has since expanded to 120 miles east, west and south of Richmond, VA, to be able to accommodate more customers. To complete all these jobs, the company currently has 52 employees. Of those, there are 21 people involved in the production, about 14 in installation, four for templating and office personal make up the remainder. As of right now, the production capacity is at approximately 900 square feet a day, five days a week. According to Kilic, roughly 3,000 to 4,000 square feet a week is the company’s goal for square footage. The company has also made several investments in machinery and tooling, most recently being the Marmo Meccanica backsplash machine. Kilic bought and installed it in December, and it has proved to be a great part of production. 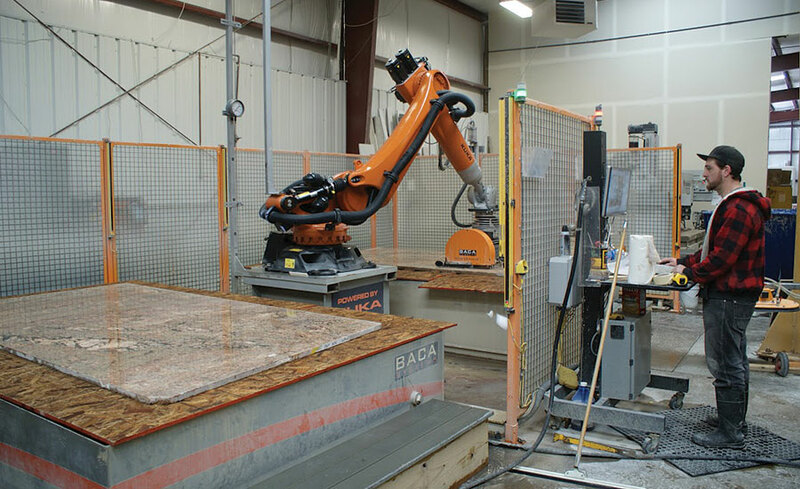 In July 2014, he bought and installed the robot cutting machine from Baca Systems. Additionally, the company recently purchased a Jib Crane, which has an Abaco suction system and Milwaukee chain hoist for lifting slabs. Investing in waterjet technology also helped CGM become faster and more accurate, and allowed them do more detailed-oriented jobs where it was previously impossible, even with the CNC’s. Templates are created using LT 55 Templators from Laser Products of Romeoville, IL, because they are user-friendly, and it is simple to convert field measurements to digital documents. In addition to being cost-effective, reliable and easy-to-use, the LT 55 accurately captures areas with many angles, and there is no maintenance on the equipment, according to Kilic. Further down the road, Kilic is even more confident. His ultimate vision for the company is to become the premier granite and quartz fabrication and installation company in the region.